If you’re building a grow room for legal marijuana cultivation, chances are you’re building it to adhere as closely as possible to existing regulations for the food & drug industry. This typically means you’re looking into resinous floor coatings. 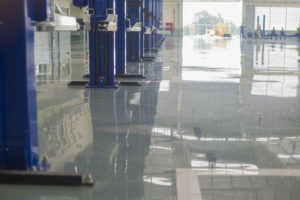 A concrete floor covered by epoxy or polyurethane is an ideal solution to creating a safe, sanitary environment for products intended for human consumption. Resinous floors are also fairly low-maintenance. They are easily cared for, and when tended to regularly, extends an already lengthy lifespan. 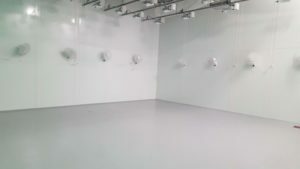 Proper grow room flooring maintenance will also ensure hygienic conditions and reduce the risk of contamination, making resinous flooring a good choice for biomedical operations. When you’re setting up a cultivation site and dispensary, you have plenty of decisions to make. But, one of the most important is right under your feet. Your choice in flooring can make a huge difference to your business, from ensuring you fall within regulations (such as they are at the moment) to making your dispensary more attractive to customers. 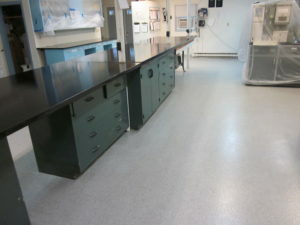 A popular choice in dispensary flooring is concrete coated with epoxy. This combination is standard in biomedical facilities all over the world. And, it’s a great option for your own cultivation and dispensary. Resinous floor coatings are the perfect choice for cultivation center flooring. We recommend them thoroughly for anyone looking to enter the booming field of medicinal marijuana. Cultivation sites must adhere to strict cleanliness and hygiene standards, which is a lot more attainable using resinous coatings such as epoxy or polyurethane. 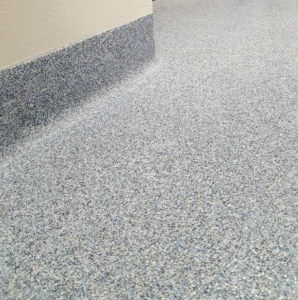 The smooth seamless surface of these floor coatings makes them simple to clean, and the right additives provide an extra layer of anti-microbial protection. 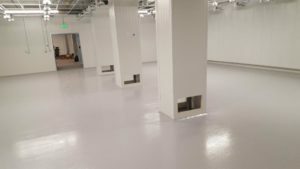 Is Epoxy Quartz Flooring Right for Your Business? At the crossroads of substance and style, epoxy quartz flooring melds the business-friendly properties of a durable epoxy coating with eye-catching color schemes and patterns to create a nearly flawless commercial flooring solution. One of the most frustrating, and challenging parts of being a flooring contractor is prepping old flooring and substrate for new applications only to see that clearly it hadn’t been maintained properly. 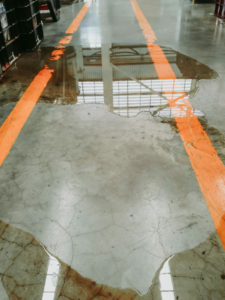 This not only creates bottlenecks in installation, but it may require a new strategy when repairing or replacing commercial floors. When customers are asked why floors aren’t adequately protected by regular maintenance, typically we get the standard answer – no one told them how to properly care for their original product. 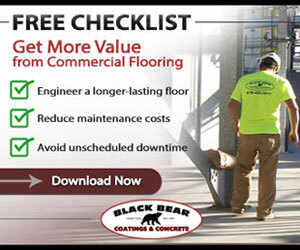 It seems like there are a lot of flooring contractors out there who simply don’t take time to explain basic maintenance to customers, which should be mandatory for job completion. In this blog post, we will explain why flooring installers should give you proper commercial floor care procedures and instructions. When properly maintained, resinous coating, such as epoxy or polyurethane, should last decades, making it a cost-effective option for businesses. 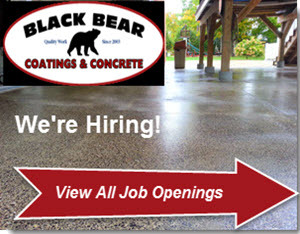 Maintaining a coated concrete floor is typically easier than maintaining other types of commercial flooring as well. Basic facility maintenance goes a long way towards extending the lifespan of your floor and preventing the need for significant repairs. Here are some considerations to help you expand the life of your floor and maximize ROI. 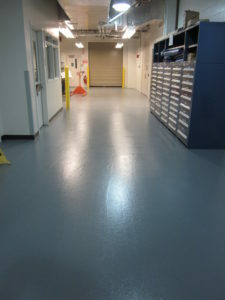 If you’re looking for a seamless floor surface that’s also highly resistant to a wide variety of hazards, from rough usage to chemical spills, epoxy and urethane coatings are a great choice. Either epoxy or urethane can create an absolutely smooth, seamless surface that’s perfect for businesses of all types. 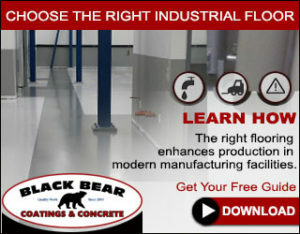 A seamless floor is the right choice for almost any business environment. They’re easy to clean, easy to sterilize, and less prone to wear and tear than other tile-based flooring solutions. From warehouses to pharmaceutical clean rooms, seamless floors deliver better safety and better ROI. That just leaves the question of what type of seamless floor to install. The three most popular options for seamless flooring are epoxy coatings, polyurethane coatings, or polished concrete. Here’s a quick rundown of the advantages of each, and what types of usage they’re best for. There are certain areas of business where antimicrobial flooring is clearly needed, such as biomedical research or food preparation. However, that raises the question: is there any situation where antimicrobial flooring wouldn’t be a worthwhile investment? After all, most resinous floor coatings can receive a treatment of antimicrobial additives or products that will render the floor resistant to most unwanted life. If you’re already looking towards using floor coatings to enhance and complete your concrete floor, adding antimicrobial properties just makes sense. 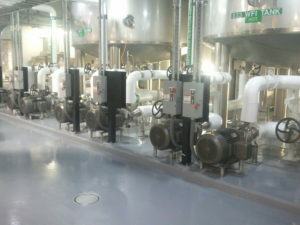 Seamless resinous floor coatings are ideal for a variety of commercial and industrial settings. For businesses, a seamless flooring system offers huge benefits over alternatives, such as bare concrete or vinyl tiles, while not having any major drawbacks aside from -potentially- a slightly higher installation cost. However, the durability and sustainability justify the up-front costs. Seamless floors are a perfect solution for a wide range of businesses. Continue reading to learn 4 reasons why you should choose seamless flooring for your commercial business. Get a Free On-site Consultation! We will come to you and scope out your project.